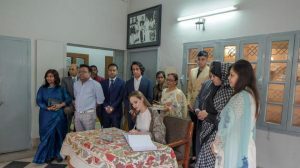 Hollywood star Angelina Jolie said she was ‘deeply moved’ after visiting the Bangabandhu Memorial Museum at Dhanmondhi 32 in Dhaka, the capital of Bangladesh, reports bdnews24.com. 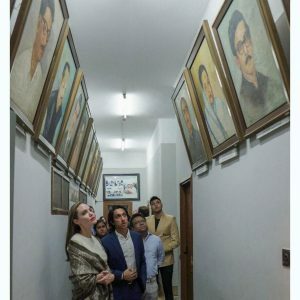 The top rated movie star paid homage to the founding father of Bangladesh at the house where Sheikh Mujibur Rahman was assassinated along with most of his family members on the night of August 15, 1975. His daughters Sheikh Hasina, the present prime minister, and Sheikh Rehana survived because they were abroad. Sheikh Mujibur Rahman’s grandson Radwan Mujib Siddiq showing showed Angelina around the Bangabandhu Memorial Museum in Dhaka on Wednesday. Radwan Mujib Siddiq, son of Rehana, welcomed the American actor, who is visiting Bangladesh as special envoy of the UNHCR, at the museum. The actor was also briefed about the life and work of Bangabandhu and given the tour of the museum by Siddiq. CEO of the Father of the Nation Bangabandhu Memorial Trust Mashoora Hossain, Secretary to the Ministry of Foreign Affairs’ Maritime Affairs Unit M Khurshed Alam, officials of the UNHCR and the Ministry of Foreign Affairs were also present during Angelina’s visit to the museum. Angelina Jolie also wrote a note in the visitors’ book of the Bangabandhu Memorial Museum. She wrote, ‘I am deeply moved to be in this very special home,’ adding that she is ‘humbled by this great sacrifice and inspired’. Angelina who is in Bangladesh earlier visited the refugee camps in Cox’s Bazar where the displaced Rohingya refugees from Rakhine State of Myanmar are presently lodged. She also urged all global organizations and the governments to maintain pressure on Myanmar to guarantee the rights, dignity and safe return of the Rohingyas, the report added.